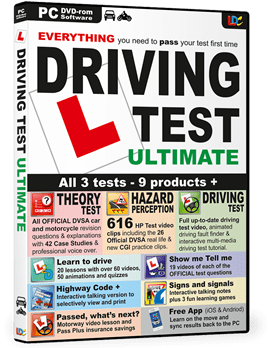 Driving Test Ultimate – The Ultimate Driving/Theory software for car drivers & motorcycle riders with over 600 HP clips. Driving Test Ultimate is easily the most comprehensive PC software of its kind. Includes all the Official DVSA questions, answers, explanations and includes case studies, hazard clips and full driving test plus lots more. No other theory product offers 600+ hazard clips to practice on with comprehensive tutorials and videos on how to make your first test your last. Includes 26 Official DVSA Hazard Perception Test practice clips. No other product offers a interactive learn to drive programme with 60 video tutorials that shows you step by step how to develop your skills using LDCs highly acclaimed LD System of driving tuition. One to work with your study of the Highway Code or One to work hand-in-hand with the early stages of your in-car driving course. Case study learning programme containing 14 case studies, one for each of the DVSA categories plus a further 14 in the mock tests. Official DVSA video introduction to the Hazard Perception Test in the new CGI format. 616 Hazard Perception video clips used to accurately simulate the Hazard Perception Test including 26 Official DVSA Hazard Perception Test sample video clips. All shot from outside of the car and in the same format as on the real test. 44 Full pre-set Hazard Perception Test simulations with review option. Each test is unique and contains a properly balanced set of hazard test types. Two tests contain the Official DVSA sample test clips making these test simulations particularly realistic. Video is shot from outside the car and in the same format as on the real test – not from behind the windscreen of the car in a lower, grainer resolution as on many other products. Nobody can match the quantity or quality of the shots we provide. Pre-set Hazard Perception test simulation review so that you can re-examine any of the 44 previously taken pre-set tests from the testing module again. Learn on the Move – Download information from the Highway Code or Supplementry notes for revision on your MP3 player, mobile phone or iPod. 8. Passed – What next? 616 Hazard Perception test simulation video clips including 26 OFFICIAL DVSA test sample clips and test introduction video providing 44 properly balance, unique test simulations. Nobody offers more and nobody can match the quality of the clips we offer. Also includes entertaining interactive multimedia tutorials to help you understand the test, the skills you are trying to develop and the common types of hazard that appear on test. Complete “Show me Tell me” video lesson with video examples of each of the 19 OFFICIAL test questions (i.e. 12 Show Me and 7 Tell Me questions). Dont get caught out even before you start by rehearsing how to answer each of the 19 official questions that can appear on the practical driving test. See below for more details. Pass plus and motorway driving lesson videos and notes together with access to the highly acclaimed interactive road safety tool 2 young 2 die produced by Brake – the road safety experts. Nothing in the market currently compares to the quality or the quantity of the Driving Test Ultimate product. It is easily the most complete and comprehensive software of its kind. Indeed it is easy to pay twice as much for half of what this product offers. So if you want to give yourself the best possible chance of passing the Theory, Hazard Perception and practical Driving Test first time as well as equipping you for a lifetime of safe driving then buy Driving Test Ultimate and put yourself in the driving seat today. Use the Contact Us link to order through us. Posted by admin in learn to drive in south wales, Pass In Torfaen, Passintorfaen, Simple Pass on February 4th, 2016 ‌ Both comments and pings are currently closed.